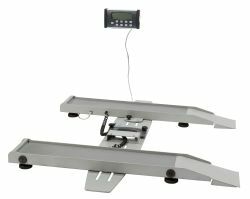 The Health O Meter 2400KL wheelchair scale has a capacity of 800 lbs and a readability of 0.2 lb with wheel base width of 25-3/4 - 50-1/8" (adjustable). The Health O Meter Digital Portable Wheelchair scale is the ultimate in take-it-with-you non-ambulatory patient weighing. 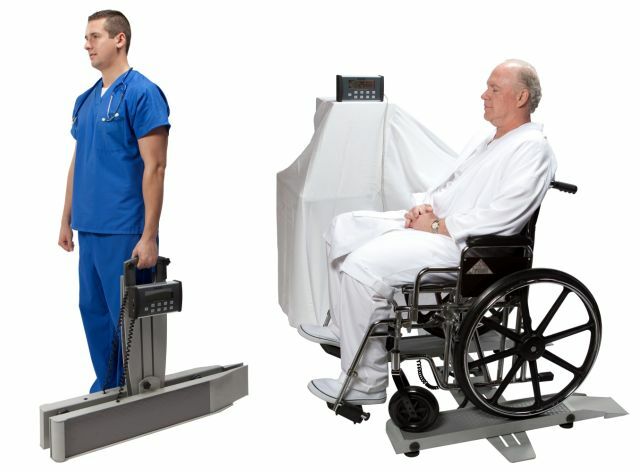 Weighing only 50 lbs and able to fold up in an easy to carry package, this scale allows care staff to take the scale where needed instead of wheeling the patients to the scale. Especially important in multi-story healthcare establishments, this scale can cut down the time necessary to monitor multiple patient weight records. The scale is not only mobile, it is also easily stored, saving costly space. Standard functions include weighing, LB/KG conversion, LB/KG lock out, BMI, zero/tare, hold/release, reweigh, recal and auto zero. The wheel tracks are adjustable and can extend from 25 3/4 inches all the way to 50 1/8 inches to accommodate all standard and bariatric wheelchairs. Furthermore, the 2400KL has EMR connectivity capability for use with EMR software via various Health O Meter Professional connectivity solutions.